Welcome to the Hawkeye Tomahawke Trading System Members area. For today’s Tomahawke education video I elected to trade the turn in the market for the GBP pairs after the dramatic weakening following the BOE interest rate hike. During the trade I arrived at a decision point when I was 1.3% up but knew there was a pull back coming. I decided to sit through that pull back and stay in the trade but, with hind sight, this was the wrong decision as the market was still looking to sell the GBP. In this trade I lost 2.5% of my account, which sometimes happens. From this I learn and then move on to the next trade tomorrow. In today’s educational video I had to be patient waiting for a set up due to the abundance of news. 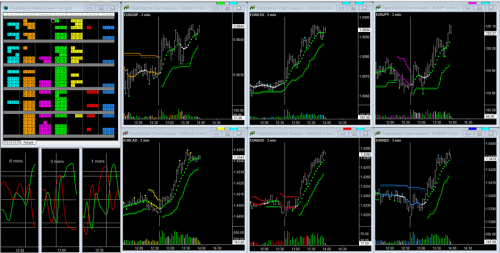 In the end I chose to trade the JPY pairs (1 min charts) on a counter trend move for +1%. I didn’t want to spend long in the trade as the bigger trends were for JPY strength and I was only trading the pullback when viewed on the 15min charts. Today’s recording of the live Q&A session is now available. For today’s Tomahawke education video I have made two recordings. The first is for the trade setups for the London open, where the GBP came into strength bang on 8am and then strengthened through till the start of the New York session. I wasn’t at my desk for 8am and so I did not trade the GBP but I did go over these trade setups later and thought that I would share my analysis with you. The second video is of my trades on the USD 3 min charts where I made 2.2% on the account. These trades had very little pip movement and so I closed them out prior to the USD PCE news release, which could well have stopped them all out. In today’s education trade I decided to trade just one currency pair (the GBPJPY) for a +1% gain on my account. I did this as I know that not everybody is comfortable to trade all six pairs for a single currency, and we can choose how many of the pairs to trade BUT we still use all of the same Tomahawke principles. In trading only one currency pair I am also able to look in more detail at the trade parameters and the Fibs. It’s half term holidays here this week, so I took so time out with the kids today, but of course still kept my eye on the markets as there was the interest rate decision on the EUR! In today’s education video I take a look at the theory of re-entering a trade on the pullback, which occurred nicely on all the EUR pairs today. This is slightly different to my normal trade videos but I hope that you still enjoy it! In today’s education video I traded the AUD for +1.3% at the London open. This was following the AUD CPI reading, which was lower than expected during the Asian session. In the video I also track the GBP setup as it turned and strengthened into the preliminary GDP reading at 9.30 London time. This is a hypothetical trade but recorded in real time. The trades would have been in profit running into the news, and if they had have been held through the news they would have gone on to make +30% and counting. I have included this analysis as I hope you find it very good education. As a consequence the video is a bit longer today (just over 20 mins) but I hope you find it worth the effort. In today’s session I discussed the counter trend trades that I took on the USD pairs this morning, which made 1% on my account, and then we looked at the price action leading into the 4pm London fix. Unfortunately, I was ill last week and wasn’t able to trade the latter part of the week, so I was all keen this morning to get going again. Unfortunately the market had other ideas and it was a very slow day with little pip movement and no strong trend runs. In today’s video I take a look at the market conditions and explain why I then didn’t take any trades. Whilst this may not sound like a great video to watch, we do need to recognise that the market is often dormant and quiet (especially on a Monday) and during these conditions we must be more content to avoid risking our capital and waiting for better opportunities that will come. For those that may have missed the Q&A session this week, the volume stopped recording after 26 minutes and Marcus does not then feel it is worth putting on the website. If for any reason you do want to watch it then we can make it available by emailing [email protected] directly. In today’s Tomahawke education video I trade the GBP at the London open for +1.5% on my account. The market on Monday morning is normally either dynamic (after weekend news) or very limp (waiting for direction for the week). However, today neither of these really happened (!) – the GBP set up very nicely but the pip movement was small and the trends didn’t have much momentum. In the video you will see that I had placed some of my fibs incorrectly and this meant that some of my trades weren’t stopped at the 261% take profit level, which was a shame as I would have made a bigger gain. In today’s education video I trade the GBP at the London open but as a counter trend trade – after the GBP had already rallied into 8am. This video is a good example of market structure and how we use that knowledge to understanding where the price is heading. I hope that you enjoy the video and have a great weekend. In today’s video I elected to trade the JPY but when these trades were going nowhere, and an opportunity arose in the GBP, I quickly closed out for breakeven and then traded the GBP. My trades quickly reach +2.5% and looked like they were going to rally into the 4pm London fix – so I stayed in the trades. Unfortunately however they just limped into the 4pm fix and so I had to settle for +1% on the account. Please accept my apologies for the late cancellation of the Q&A session this week and for the lack of education videos. I had my parents staying with us and my Mum wasn’t well so I took some time out. In today’s educational video I take a look the trade setups today for the EUR. This is a hypothetical look at how we could have identified the trade setups from the charts & Fatman and then traded each of the EUR pairs. This is a different video format than usual and shows how we can review our trade setups at the end of each day. I look forward to being at my desk again tomorrow as usual. For today’s educational video I chose to trade the turn in the market for the GBP, which did turn, but, as I will show you – nobody was interested in buying the GBP. The trades did make 1% on the account but the take away point is that the Fatman indicates the turns in the market and the strengthening / weakening cycles, but it does not tell us the size of those moves in pips. In today’s educational video I was planning to trade the aftermath of the Services PMI news release on the GBP. However in the end I chose to trade INTO the news release and this provided some good educational material. Please note that this is not part of the recommended Tomahawke trading strategy, but I do hope that you find the trades informative and interesting. The recording of this week’s live Q&A session is now available. In today’s educational video I look at counter trends in strong trend runs – what to look out for if trading the counter trend or if looking to re-enter the main trend. All this week I am trading the London open and aiming to make 1% on my account. See how I finished up the week in my daily video. As for Tuesday and Wednesday my trading plan today was to trade the London open for a 1% gain on my account. See how I got on in today’s video. With limited trading time (as yesterday) my trade plan today was to again trade the London open for a quick 1% on my account. The GBP provided the ideal opportunity and you can see in the video the trades were simple and straight forward. This week I am making a few more training videos and testing some new improvements that we are bringing to Tomahawke – and so I wanted to free up my time by only trading the London open for a quick 1% on my account. In today’s video, from Tuesday 26th September, I traded the USD. I got into these trades at the start of the trade run (that ran all day) but then closed out as soon as I hit my profit target, including 1 losing trade. On Friday I traded the London open again and made 1% on my account, to recover yesterday’s loss. However, as you will see from the trade video, sometimes it takes a while to understand what is going on in the market and in this case I had to think on my feet and act accordingly. Not all trades run smoothly and this is a case in point. I hope you have all had have a great weekend and it will be interesting to see the markets on Monday following the German elections, New Zealand elections and reaction to UK Prime Minister May’s speech. For my Tomahawke trade today I elected to trade the London Open on the 1min charts. This was a turn in the market for GBP weakness. I made a loss on the trades of 1.3% but this was through poor trade execution and decision making. It is always important to review both winning and losing trades in order to improve and I hope that you find today’s video useful. See how I achieved this and the parameter that I used in the video. The recording of today’s live Q&A session is now available. In today’s session I discussed a few new tools that we are currently developing for Tomahawke, answered a few members’ questions and then finished the session with a example of how the price structure in Forex is the same for all timeframes. If you have been watching my HawkeyeFX blogs you will know that I am currently looking for the GBP to turn and weaken on the 4 hour charts. (Last week I closed out of my GBP long term trades in anticipation of this turn in the market and these trades are detailed in 2 separate videos). On Friday I took some new long term trades on GBP weakness and in today’s video I detail how I got into the trades and what I am expecting. These long term trades follow the same principles of the Tomahawke system and I am providing this series to demonstrate how the understanding the long term trends helps in our intra day trades on the shorter timeframes. Today saw the GBP jump in price on the back of the interest rate decision from the Bank of England. The rates were kept on hold but there was a hawkish tone to the meeting minutes. This jump in the GBPJPY price (back up to the 148.00 level) enabled me to close out my long term GBPJPY trade that I have been holding for 3 months, since the 14th June 2017, for a gain of 7% and a net gain of 4.5% across the original 6 trades. I hope you like this longer term video series and find it very useful to understand market structure and the use of the Fatman in our trading. In today’s video I close out my long term trades on the JPY pairs that I took back on the 11th August 2017. The CADJPY was closed for +7%, the GBP had previously closed for -2% and all the other trades were stopped out for break even. The aim of these trades was to demonstrate the use of Tomahawke on the longer timeframes and to show how we can trade all the different time frames in exactly the same way. The previous videos can all be found in the “Trading Longer Time Frames” area of the website. There is some good education here and I hope that you enjoy this video series. Today I had 3 choices of trade – the JPY, GBP or USD and I chose the USD on the 15min charts. Unfortunately this was the least strong of the 3 but I still made +1%. The JPY and GBP would have been the better choices and I look at this in the video. I will be at the Hawkeye London seminar on Sunday, Monday and Tuesday so my normal service will resume on Wednesday next week. There will be an email to confirm if the Q&A session will go ahead next Tuesday. In today’s Tomahawke education video I traded the aftermath of the ECB interest rate decision for a +2.2 gain on my account. In the video I also take a look at the EUR and its current weakening cycle. For my trade example today I was looking to trade the aftermath of the BOC interest rate decision, which was expected to be kept on hold. However, with the surprise increase to the interest rate, the market had a knee jerk reaction and the CAD strengthened each of its currency pairs by over 200 pips. This extreme spike in the price then meant that there would be no trade for me and in today’s video I explain why that was the case. In today’s Q&A session I look at the software update released last week and answer some general questions on the Tomahawke system. The latest Q&A session, hosted by Randy Lindsey in Marcus’ absence on vacation, is now available. For all users of the Tomahawke MT4 platform and Tomahawke Trader EA’s we have just released a software update to correct technical issues with the Tomahawke Scanner and Tomahawke Trader, which have come about due to software updates on the underlying MT4 platform. In this software update I have also taken the opportunity to update the MT4 Tomahawke templates and profiles, which are now designed for both single and multiple monitor setups, and allow for faster trading. For a full explanation of the software update, installation instructions and demonstration of the new profiles, I have made an instructional video that can be found in the MT4 setup section of the Hawkeye Tomahawke Member area. It is important that this software upgrade is installed for more accurate and safer trading and I hope that I have made the process as simple as possible by providing a detailed instruction video. I am on vacation this week, so if you find any issues with the software update please email [email protected] for assistance. I wish you all the best for your trading this week and I will be back to my desk next Monday. In today’s trade example I looked to trade the GBP out of the GDP news at 9.30 London time. This is a trade example of jumping into a trend, which was actually a counter trend to the main trend, identified using the Fatman and price action. I made a very quick 1.2% in under a minute. In my trade today I elected to trade the NZD pairs as they turned in the market. The trades quickly reached +1.6% on my account but I then had a decision to make as the 1min and 3min Fatman were overbought and about to turn down. Would I stay in the trades and sit through the pullback, waiting for the resumption of the larger trend, or would I close the trades and take my profit? Find out what I did, and more importantly why, in today’s video. Today’s Tomahawke Q&A session is now available to view and is based around a number of questions submitted by members via email. I hope you had a great weekend and are ready for a new trading week. In today’s video I take a look at how my longer term trades on JPY weakness are getting on (trades taken on the 17th August 2017) and the 3 lessons that can be learnt from the manner in which these trades have played out. Do look out for my weekly review on HawkeyeFX.com and also my weekly Q&A session on Tuesday at 9.30ET (2.30pm London time). Further to yesterday’s Q&A session I wanted to trade the London open today and give my thoughts on selecting the trades from the Fatman. I traded the GBP pairs for +1% on my account and the video is now available in the Daily Archive. In today’s video I take a look at how the longer term trades on JPY weakness are progressing. This is a second video in the series, with the first video recorded on Friday 11th August 2017. I will be holding these trades for the next few weeks so we can review and learn from their progress, so do watch out for more in this series. In today’s Q&A session there were some great questions submitted via email that I could take time to explain. These centre around how to read the Fatman in general trade and also during the London open. My trade for today was to jump into the trend for USD strength in the aftermath of the USD inflation news. Unfortunately the news was worse than expected and the USD initially weakened so I could not take the trades. In today’s video I have therefore used another recording that I was making on the 1hour charts to trade JPY weakness, which was for my HawkeyeFX blog. If you have not seen my last two blogs I am looking for the JPY to turn and weaken as indicated by the long term Fatman. In this video I use a BUY STOP to enter the trades, which occurred over the USD news. I also look at what happened to the spread during the news announcement and this is something that we need to be aware of. I hope you enjoy the video as it is a little different from my usual trades. I also hope you all have a great weekend and see you next week. 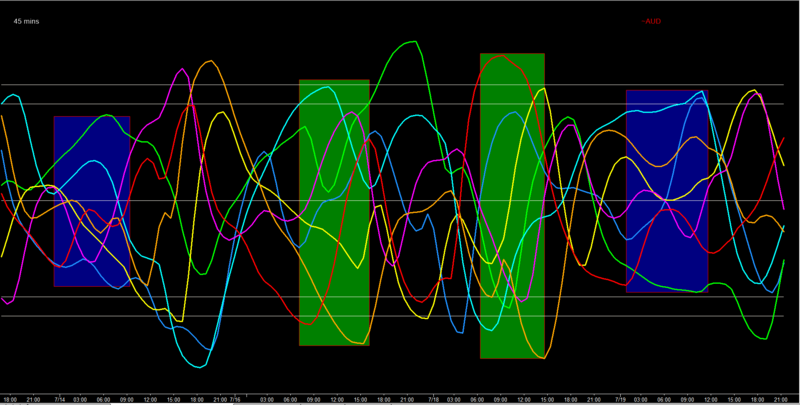 Today I traded GBP strength at the London open on the 1min Charts for +2%. See how these trades set up and panned out in today’s video. In today’s Q&A session I looked a ‘fake outs’ and how we can look to avoid them in our Tomahawke trading. I hope that you have had a great weekend and ready for a new week, although I must say it is likely to be very quiet through the rest of August as we are in Holiday season. In today’s video I found an opportunity to trade USD weakness but the trades didn’t develop over time and so I decided to exit all the trades for a breakeven day. I hope the video is beneficial to help read the market conditions and when to exit a trade. Today I made 3.2% on my account trading GBP strength into the Services PMI news release. Take a look how I did it on today’s video. In today’s education video see how I traded the GBP pairs at the London Open (1 min charts) for a +2.5% gain on my account. In today’s Q&A session I took a look around the market and gave my view on the current trades as shown by the Tomahawke indicators. Monday mornings are normally quiet in the Forex market and today was no exception, especially as we are still in the holiday season. I did take a look at the market at 8am and found a trade setup on the EUR, which I traded for +1% on my account. As you will see in the video, I was stopped out of 2 of my trades during the first 6 hours as the price meandered, waiting for the market to wake up, before finally coming into strength in the US session. Yesterday ahead of FOMC the market was extremely quiet and I didn’t find an opportunity to trade. Today the London morning session was also very quiet but trade did pick up into the American session. In my trade today I elected to trade the GBP on the 15min charts and made 1.5%. In my video I explain why I chose to trade the 15min charts, the Fatman I look at and the mid set I have for trading these charts. In today’s Q&A session I run through the process that I follow when switching on my computer and then identifying trades. The market was extremely slow on Friday and Monday and this is typical of the trading conditions over the summer months of July and August. I was expecting today to be slow again as there is a lack of tier 1 released, but I did find a opportunity to trade the USD at the London open for a quick 1.8%. These trades can be viewed in today’s video. Today the Forex market was extremely quiet during the European session and I was not able to find a trade during my trading hours (which of course happens and is part of trading). This was in part due to the time of year (being the traditional holiday season) and to the complete lack of news releases in the European morning session, but also (and more importantly) as we wait for the interest rate decisions from Japan and Europe tomorrow, which will move the market. Now recognising when the market is slow and choppy and therefore when not to trade is as important as identifying a good trend run – so that we can protect and maintain our account. In the 45 min Fatman shown below, I would like to show you what a quiet market looks like compared to more favourable trading conditions. The lines are much more horizontal caused by a lack of pip movement. The lines are more twisted and zig-zaggy showing choppy price action. The lines are much more vertical, indicating good pip movement and momentum. The lines are straighter and have more defined turns caused by smoother trend runs. It goes without saying that the trend runs that we look to trade in the Tomahawke system will therefore be found more easily in the conditions found in the Green boxes. In today’s Q&A session I look at how we identify trade setups on all timeframe using the fib levels, and how these are all traded in the same way. In today’s Tomahawke Education video I detail my JPY trades on Friday 14th July 2017, when I made 1% on my account. Having identified that the market was extremely slow, I elected to trade on the 15 min charts and this is no different to the process that we use for the 3min charts. In today’s education video I look at my trades this morning at the London Open on the 1min charts. The trade setup was not ideal and took me a little bit by surprise (! ), but I took the trades as I wanted to be able to demonstrate a few of the key components of Trading the London open, which I went through during this weeks Q&A session. I closed these trades for break even on my account, having identified that the market was about to turn from the Fatman and this is also explained in the video. In today’s Tomahawke education video I wanted to record a further example of using the 45 min Fatman to identify my trades and then following them through from setup to close. Unfortunately, as you will see in the video, the EUR never turned up on the 45 min Fatman until about 8pm GMT, even then it was extremely oversold, and so I was not able to enter any trades. What we can learn from this is that we have to be patient for our trade setups and also flexible in looking for the different opportunities that the market presents through the day. I hope the short video is still informative and helps build our knowledge of how the Forex market can play out in different scenarios. In today’s Q&A session we had some very good questions on the way we use the Tomahawke Scanner, Trend+Stop indicator and Volume in the Tomahawke system. The market was extremely quiet today and there was very little opportunity to trade in the choppy price action. Historically the Monday after NFP is very quiet in the Forex market. the spikes in the GBP pairs were caused by illiquid conditions. The only currency pair to see some price movement and volatility today was the CAD and this was on the back of oil and in light of the interest rate decision on Wednesday. In the screen shot below, it can be seen that the CAD did turn up from overbought territory on the 45 min Fatman and that there was a trade setup in each of the 6 CAD pairs, with the red arrow showing the retracement. However all 6 trades were still very slow and they only reached the first profit target (at the 161.8 level) for, on average, just 20 pips. Today there is more news out and the market should pick up. If you have any questions please do join me in the Q&A session starting at 9.30am ET. Today I wanted to bring you another example of using the 45min Fatman to identify new trend runs and this came from the EUR. The video looks at the setups and profit targets for each of the EUR currency pairs. In yesterday’s Q&A session I looked at how to use the 45min Fatman to identify new trend runs and so today I recorded some trades on the GBP to illustrate that theory. I did have a few problems with my video recording and my internet went down for an hour (do ensure you can access your trade account by phone for this occurrence), so this is mainly a recap on the theory and description of my trades with the trade log, but with limited video recording of the actual trades. I held the Q&A session today but appreciate that many people could not make it due to the US Independence Day holiday and also because the email notification accidentally said that the room was cancelled in its header. If you would like to catch up with the recording it is now available in the Weekly Live Q&A area. During today’s session I answered a number of questions on identifying trade setups and how best to use the Fatman. Today was the Month end, Quarter end and the Half Year end and is historically a very busy day on the financial markets as books are balanced. I was expecting some strong trends in the Forex market but the European session was relatively quiet and the market only got going a bit in the American session. In today’s video I was tracking the GBP pairs and had a near perfect trade setup ….. but then the GBP went into consolidation for 4 hours and I never got the trade entries. Not all trade setups play out and this is a good example that we can learn from. I hope you all have a great weekend and I look forward to trading again next week having preserved my capital today. I have not been well this week, so I apologise for missing the Q&A session on Tuesday and for my lack of trade examples this week, as I have not been trading. In today’s video I take a look at the long term trades that I took back on the 14th June 2017 to see how they are getting on. If you remember from parts 1 and 2 in this series I was using these trades as education for holding trades through news releases and over longer time frames. Of the 6 trades that I took only one is still live and this is now in good profit. The all three parts of this video can be viewed in the Trading Longer Time Frames area of the website. I hope that you had a good trading week and are now looking forward to the weekend. One of the most important concepts that we need to understand when trading Forex is that there are price waves within price waves – so on the 1min chart there may be an uptrend but on the 3 min chart this is simply a pull back in the larger downtrend – or in the Fatman the 1min chart can be showing strength but in the 3 min chart weakness! This may sound very simple but it does take a little bit of effort to really understand and apply in our trading. I have previously made 2 videos to explain ‘waves within waves’ (found here) and I would recommend them to all our new members, or as a refresher to those member who where here when I first published them. It was a quiet morning during the London session, but then the CAD got going with a small bounce in the oil price and impressive Retail Sales. In todays video I show how I identified and then traded the turn in the CAD following the strong run for +3%. Again I have tried to give extra insight into my trading decisions and I hope this helps. In today’s video I wanted to record a trade on the 1min charts at the London open as I haven’t done that in a while. See how I get on, and just why it is so important to keep you eye on the news during your trading session. In today’s Q&A session I talk through the process I go through each time I sit down to trade and how I then find my trades. I also discuss identifying the profit targets in response to some of the questions raised. I hope you had a great weekend and are looking forward to a new week’s trading. In today’s Tomahawke Education video I take a look at the GBP at the London open, and then my trades on the GBP after the press conference after the first day of the Brexit negotiations. These trades didn’t progress and after about 3 hours I exited my position for a very small gain. In Friday’s trade video I take 6 trades on the JPY as I identify a turn in the market using the Fatman, Volume and Tomahawke Trader. I am up 3% and decide to stay in the trades for the first pull back but this pullback stops me out on 3 trades. Once those closed trades set up again I re-enter and then close out all my trades for +2.5% less my loss of 1.5% = +1% for the day. Yesterday I took 6 GBP trades with the aim of running them into the Bank of England interest rate decision today (for education purposes). In today’s video you can see how these trades panned out through that major news announcement and my decision process thereafter. This is good education looking at the longer time frames, which ultimately helps us to trade the shorter timeframes. I am always looking for opportunities to produce different education videos so that we can learn from new trade examples and not just see the same trades repeated each day. In today’s video I take trades in all the GBP pairs, as the currency bottoms out and strengthens before the FOMC meeting. What I am looking to do with these trades is to then run them through todays FOMC news, through the Asia session and into the Interest rate decision tomorrow from the Bank of England. This will be a 2 part video and I hope that you will enjoy seeing how these trades unfold. In today’s Q&A session I answer questions on the Tomahawke MT4 indicators and installation. In my TradeStation account I set the price axis in increments of 10 pips so that I can see how far and fast the market is moving at any one point. As you know this is not possible with MT4 and it is often very difficult to gauge how many pips the price has moved in a particular bar or over a period of time. If you would like to use the indicator in your trading, please email me directly and I will send you a link. I hope that it helps you in your trading. Government elections come round very infrequently, but I do love the drama of the results unfolding and the corresponding swings in the market. In today’s video I take a look at the GBP currency pairs and how they reacted to the UK election results on Thursday night. Today’s Q&A session was held at the new time of 9.30am ET, which we hope suits more of our members. This is your opportunity to ask any setup or trading questions on the Tomahawke system or Forex in general. Today’s recording includrd a trade on the USDJPY. This is not the standard Tomahawke setup but it is a nice example of how we can read the Fatman to our advantage. Don’t forget the Q&A session will now start at 9.30am Eastern (2.30pm BST, 11.30pm AEST) on Tuesdays. As today is non farm payroll I expected a quiet London open and it was! I did take some trades on the GBP and, although these were exited at breakeven, I have still made a video as I think it helps to see my rational and thinking during the trades. Not expecting to then trade again till after non farm payroll, a UK election poll was release and this showed a reduced lead for the Conservatives, which I knew would bring weakness into the GBP. I jumped into the trend for a quick 2%. I hope you all have a great weekend and see you again next week. In today’s video I look in detail at the standard Hawkeye Tomahawke setup, using yesterday’s GBP trend run as the example. If you are new to Hawkeye Tomahawke then this is really recommended viewing as it goes over and reinforces what we are looking for in our standard trade setup and trade management. Scalping the forex market always runs the risk of being hit by an unexpected news announcement and this was the case during yesterday’s live Q&A. I was trading EUR weakness when “ECB sources suggest ECB likely to remove ECB easing bias at June meeting” and the EUR spiked 50+ pips and stopped me out of all my trades, which at that time were up by over 2%! This is unfortunately just part of trading and we need to just accept it and move on to the next trade. The stops protected the account from any significant loss. In today’s video I identify that the EUR is currently weakening and so I was looking for an opportunity to trade EUR weakness. With the EUR on the 15min, 8min and 3min Fatman in overbought territory all at the same time I identified an opportunity to jump into a turn in the market using the Tomahawke Trader (not the Tomahawke Fib Trader). You can see how I got on in today’s video (+2%) and then in today’s Q&A session I will be looking to re-enter this trade and that video will be released tomorrow. Wow – so no signs of a quiet Friday ahead of the Bank Holiday weekend in the US, UK and China, as the market gets jittery and there is a ‘risk off’ rush to the JPY safe haven currency. In today’s video I look at that trend run on the JPY over the last 48 hours. I hope that you all have a great bank holiday weekend and I will resume my Tomahawke service on Tuesday for the Q&A session. In today’s video I recognised that the market was very slow and therefore I elected to trade the 15min charts. The GBP is currently in a weakening cycle and, with the miss on expectations for the GDP news, I was presented with an ideal trading opportunity. The trades took 5.2 hours to play out but I did end up with a +5% gain on my account. Patience was the key as I rode through the choppy conditions and waited for the larger trend to follow through. The weekly Q&A webinar is your chance to ask me any questions on the Tomahawke system or trading Forex in general. In yesterday’s session, when not answering questions, I took a look around the forex market and then took 3 trades on the EURCAD, EURAUD and EURNZD for a gain of +0.8% on my account. At the London open today I was looking to trade the EUR, and the currency set up nicely for a +4% gain on my account, which I have recorded in today’s video. I hope you had a great weekend and are now looking forward to a new week of trading. I joined the market for the open of the American session today and recognised the opportunity to make a quick 1% on EUR strength. The JPY is currently in a strengthening cycle and set up nicely at the London open. I made 2% on my trades, but as I explain in the video I didn’t feel like I traded very well and I hope that we can all learn from this. 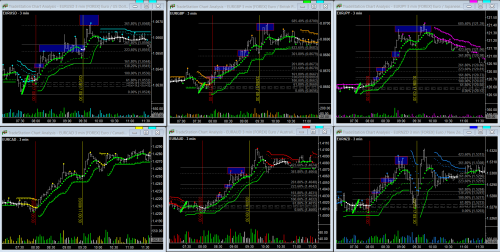 In today’s video I identified that the JPY was in a strong trend on the 15 min and 60 min charts against all its pairs. I then looked for a pullback in that trend so that I could jump in and run with that bigger trend. For this trade example I use the Tomahawke Trader EA and not the Tomahawke Fib Trader EA, which is used in our standard Tomahawke trade setup. In today’s Q&A session I answer your questions and then look for trade setups with an overview of all the Forex pairs. Today I was therefore looking for an opportunity to trade GBP weakness and this presented itself after the GBP pairs rallied into the 4pm London fix. It wasn’t easy, as the market was slow, but I was pleased in the end to secure +2% for the day. In today’s video I wanted to show you something different and I spotted an opportunity on the EUR to show how we can identify a turn in the market from confluence in the Fatman. Having spotted that the EUR was about to weaken I just jumped into all 6 EUR pairs, and you can see how the trades worked out in the video. I hope this video demonstration helps to build your confidence in reading the Fatman. Today’s red flat news ticket was the GBP interest rate decision and inflation report, which they now call ‘Super Thursday’. However my internet service was down and so I was unable to trade the aftermath of that news release as planned. In today’s video I have therefore taken the opportunity to look at the JPY and its current trend. I also examine today’s news release to see how the market uses these news releases to move a currency or initiate a change in a trend. Trading conditions have been quite tough over the last few days with slow choppy price action and in today’s video I look at why this is. The first half of the video looks at the current trends in the GBP, EUR, USD and JPY and how they are in transition. The second part of the video looks at my trades today on the GBP weakness for +1%. 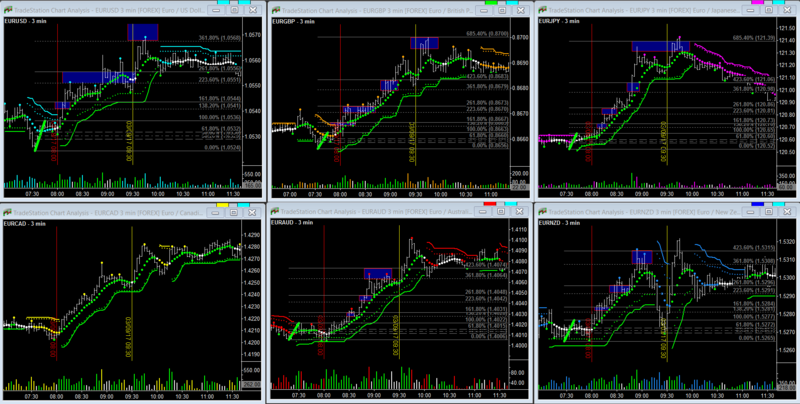 I hope that the extra analysis today give a fresh insight to the current direction of the various currencies. It’s a very quiet start to the week on the FX markets but the volatility will start to pick up into Wednesday and Thursday, which we shall look at in today’s Q&A session. I’ll also look at the French election and what the market was telling us, along with answering the session questions. Nonfarm payroll day – and it wasn’t very exciting! In today’s video I look at the market prior to and after the nonfarm payroll news release to see what we can learn. I hope you all have a great weekend and do watch out for the French election results when the market reopens next week. In today’s video I want to go over the theory of the GBP trades that set up at 8.30 BST because they had a great structure to them. It is always good to reinforce our knowledge of the Tomahawke theory and I hope this video really helps. Learning to sit on your hands and not trade is as important as trading, as we need to protect our profits and not give them back to the market. In today’s video I look at GBP weakness at the London open where the trades looked to be setting up but did not materialise. The market was very quiet and we can recognise this from the volume and price action. I hope you all have a great weekend and enjoyed the day off on Monday if it was a bank holiday for you. In today’s Q&A session I looked at tracking a currency as the trend changes, which I hope improves our understanding of how to watch a trade come into strength. About 95% of my trades are on the GBP pairs as they have really good pip movement but I do trade other pairs! In today’s video I trade the USD pairs for a 1% gain. The trades took about 2.5 hours to play out and I had 3 plus trades, 1 minus trade and 2 break even trades. I briefly look at each of the trades in the charts and then skim through the trade recording at the end. It’s a slightly different format that I hope adds to our ongoing learning. I’ve had a bit of a ‘groundhog day’ as the EUR setup for a trade at 12 noon today, which was almost exactly like yesterday in the Q&A session – so I traded it again and made an identical 2%! Today’s video shows how I got on, and hope it’s not too similar to yesterday’s video to still make it interesting!! In this week’s Q&A session I took the opportunity to do some live trading on the EUR pairs, which setup nicely for a +2% gain on my account. In the video I try to fully explain all my thinking and actions as the trades unfold and I hope that aids your understanding of the Tomahawke system and your trading in general. In today’s Tomahawke video I take a quick look at how the market reacted to the results of the French election (first round), and then go on to analyse my trades today on the GBP. With the first round of the French election held this weekend, I take a look in today’s video at how the EUR performed this week and what that can tell us. The market doesn’t expect any surprises, like Brexit and the US election, but the polls can be wrong! For those of you that like to trade the slower time frames I look at the chart setups on the 60 min charts. I hope you all have a great weekend and watch out for potential fireworks at the open of the market on Sunday! Not all trades work out. In today’s video I look at my trades through the London open where I ended up with 2 plus trades and 2 minus trades for a breakeven session. Yesterday’s news, where the UK Prime Minister called a snap election for the 8th June 2017, caused the GBP to rally and break key levels of resistance. In today’s video I want to show my trades from the London open where I made 3.5% on my account. The Fatman indicated that there was pound strength at 8am and I traded it aggressively, knowing that the GBP was still in a strong uptrend from yesterday. In today’s Q&A session I look at the surprise announcement by the British Prime Minister to hold snap elections on the 8th June, which rallied the GBP. This slightly high-jacked my planned discussion for today, but I do then go on to look at the ‘shoulder pattern’ in the Fatman and why we look for this reoccurring pattern to support our trade decisions. In this week’s Q&A I look at JAWBONING and how President Trump moved the USD by simply stating that the USD dollar is getting too strong. I also consider the wider implications of unforeseen news occurrences; how we protect ourselves and how we can profit from them. I hope you all have a great Easter break and I will resume my videos next Tuesday. Please note that the trade volumes will be low over the holiday period. So the USD was strengthening between 11am ET and about 2pm ET yesterday, and I’ve a few trades on but happy to step away from my computer as the market has gone quiet and volume low . . . In about 12 minutes the USD weakened 47 pips against the GBP, 63 pips against the EUR, 59 pips against the JPY, 47 pips against the CAD, 34 pips against the AUD and 46 pips against the NZD. So, for those of you who don’t know, let me introduce you to a technical term, or more specifically jargon, in our Forex world called “Jawboning a currency”. This is where central bankers, leader or politicians talk down their currency to weaken it against other currencies, mainly to make imports more expensive and exports cheaper, bolstering the economy. 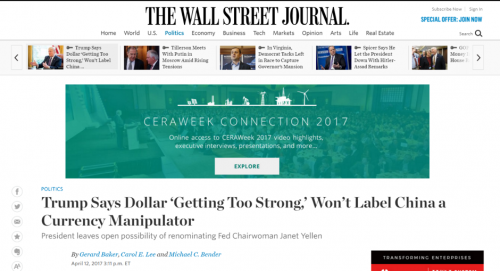 – he would prefer the Federal Reserve keep interest rates low. If your President wants to weaken your currency there are ways and policies that he can put in place but just a verbal suggestion or comment in that direction can also have a desired effect – as shown in the charts. This statement could have a meaningful impact on the USD over the next few weeks as Financial analysists work out what may be done and what the effects could be. For our trading, it is a good reminder to have calculated stops on all our trades and to also accept that the Forex market occasionally throws in curve balls, and that this is just part and parcel of trading. On the flip side, these occurrences can also provide great trading opportunities! I hope you managed to get more out of the sweet GBP and JPY trend runs today than I did! It was a frustrating day for me as I got lulled into having an opinion that the GBP and JYP would both weaken today and, as a consequence, I missed out on taking some nice trades. Today’s video is more for myself 🙂 as I look at why I formed an opinion that was wrong and why I didn’t just follow the indicators as I teach! Thankfully I was still able to have a profitable trade at the London fix. I hope it helps us all learn to become better traders. Yawn, Yawn, Yawn – what a slow Monday! I did look at the GBP at the London open but its pairs only average a 24 pip range for the whole hour between 8am and 9am GMT. The CAD was the only currency to have tradable movement but that was still within its daily ranges. However, the quiet market presented me with the opportunity to record a time lapse video, which turned out to be a very good example of how there are price waves or trends within trends. If we can really understand this then we can trade with confidence. The video and explanation looks at the turn in the NZDCAD pair, at 8am ET, over various timeframes, and I hope you really find this video informative. Following my GBP trades on Thursday at 1.30 GMT (as detailed in the video from the London Open 04-06-17) I then looked to see if the GBP strength would return to the market for the London 4pm fix – to sneak in a further trade. See how well I did and how the trades panned out in today’s video here. I hope you all had a positive weeks trading using the Tomahawke system and have a great weekend. In today’s video I detail my trades on the GBP at 1.30 GMT for 1.2% net gain. This was using the Tomahawke standard trade setup and exit using the Fatman. I also just touch on my London open trades which were breakeven. No trades are ever the same and so this is, I hope, a good learning video. It is important as traders to understand that the market uses news releases to move currency prices, whether that is from algorithm computer trading, making use of the increased volume to execute big trades or the like. In today’s video I was all set up and waiting to take a trade on the JPY pairs when the ADP nonfarm employment change news was released and the price spiked. With this recording I was then able to analyse how and why the JPY pairs had greater pip movement than the USD pairs, which may not have been expected on a USD news release. I hope that you find the video interesting and contains good knowledge to become more experienced with our trading. In today’s Q&A session I looked at opportunities to just jump into the market and, as illustration, I used my video from the 31st March 2017. How often do we see a currency pair move on the charts, and then move some more, then some more so we jump in – only for it to then turn on us straight away and put us in drawdown? By reading the Fatman we can avoid jumping in when the price is over bought and about to turn. We can also be wise on our stop placement given the risk:reward of the trade. Monday morning trading at the London open can be dynamic (as we saw last week) or a ‘damp squib’ as the market meanders whilst looks for direction after a quiet weekend. Today’s London open was very quiet, with no currency pair having more than 30 pip movement between 8am and 9am GMT and most pairs with less than a 10-pip range. In today’s video I look at what a very quiet Monday looks like, so that we can be aware and not trade those conditions. Learning to read the Tomahawke indicators enables us to spot trading opportunities and just jump into the market – without having to track a trade and wait for the trade setup. I hope you all have a great weekend and see you next week. In today’s video I look at the theory of the standard Tomahawke trade setup and use the GBP trade at 10am GMT on the 30th March 2017 as the example. When the Fatman is strengthening in all timeframes then we know that we have a high probability trade. In this trade example I want to show you an example from the Euro on Monday 27th March 2017. In the Fatman below at 12.40 we can see that the Euro turns up and is strengthening in all the timeframes. If we look at that same time in the Euro charts it precedes a strong move and we could have looked for our entry into this trends, from this point. In this week’s Q&A session I look at my London Open trades from Tuesday 28th March 2017 and consider the points at which I am feeling in my comfort zone and when I go out of my comfort zone as the Fatman turns. 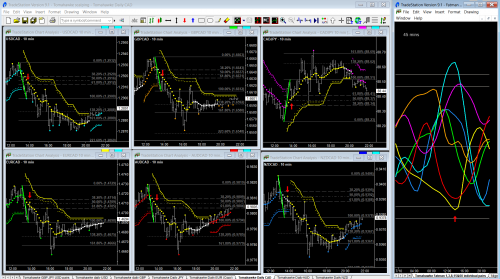 I also look at MT4 setup for Multiple monitors. This puts the scanner and Fatman in a different window (as these are used unchanged for all trading) and the price charts in a separate window, so that we can quickly change between currency pairs and timeframes. On Monday March 27th 2017 the GBP had a nice trend run from 7am GMT and through the London open. (See my previous video). These trend runs topped out around 3pm GMT and I identified the opportunity to trade the GBP weakness into the London Fix. In the videoI identify that the Fatman had indicated that the GBP was turning and it is a good example of why we need to follow the indicators and not our opinions!! I hope you all had a great weekend and ready for a new week trading. Mondays can be tricky in the market as we need to be aware of any news over the weekend and also that trading can be very light. In today’s video I show my trades on the GBP at the London open, which yielded +3%. The GBP had already been in a trend run since 7am and so I jumped into the trades with the increased volume at 8am. In the video I explain my thought process and actions, which I hope will help and make the video more educational. The Forex market was very slow on Friday and consequently we should not be hard on ourselves if we had a tough day. There were vey few trade setups and limited pip movement, which curtailed any significant trends runs. In today’s video I look at just how slow the market was by calculating the daily pip movement using the ATR indicator. From this analysis, we find that not one of the currencies that we trade managed to achieve its daily range and many didn’t even reach 50% of their daily range. So if you had a tough day, don’t be hard on yourself and enjoy your weekend! See you next week when we will get stuck in again. Today’s Tomahawke Education video shows a very good example of the standard trade setup that we look for in the Tomahawke system. The trades are on the JPY as it turns at 3pm GMT, having strengthened over the past 24 hours. In today’s Q&A session I looked at how there is currency price movement from either an increased demand for a currency or a reduced supply from the banks. Unfortunately the sound quality in the video is very poor and so I have cut the video down to just my initial presentation on the subject. In my last video I briefly mentioned that we can step up our trades from trading, say a 3min chart to a 15 min chart (if we wanted to stay in a trade for a longer time period), providing the conditions are right. In today’s video I look at my London Open trades, on the GBP, to show my analysis and to see if the conditions would have been right to step up from the 3min charts. Today’s video is a recording of my trades at the London open on the GBP where I made 3%. What I have tried to focus on in this video is to explain my thought process as I take, monitor and then exit the trades. This applies to all trades (not just the London open) so I hope that it is good education for all. I hope you all have a great weekend, it been a busy week on the Forex markets. It is crucial to our trading that we understand how there can be price waves or trends within trends on multiple timeframes. If we can grasp this concept then we can identify high probability trades whereby a currency is strengthening concurrently in multiple timeframes. In today’s video I look how we can have waves within waves with both a hypothetical and live trade example. In today’s Q&A session I looked at how the price for each currency pair moves in waves and then, more specifically, how each of these waves, in different time charts, relate to each other. Having this understanding is very important to our trading as we must know and understand the wider context of our trades. For example, we may be trading a trend on the 3-min charts but not realising that we are trading against the 15min and 60min trends and the longer term Fatman. With this understanding (in this trade example) we would then know to keep the trade short and be expecting the market to turn back into the bigger trend or to pass on the trade altogether. During the presentation I also show a time lapse video of the scanner so that we can see how these waves or trends come into and out of the market. The presentation and analysis is complete in the first hour and in the second hour I look at the market, trade setups and answer questions. I opened my charts at 7.40am GMT and found to my disappointment that I had already missed a strong trend run in all the Pound pairs, the GBPCAD having already rallied over 100 pips. In today’s video I want to show you how I determined from the Fatman that the GBP trend run would not continue through the London open, and how I then successfully traded GBP weakness for my daily profit. In today’s blog I want to highlight a very typical pattern in our charts that happens at the end of a strong trend run. The main trend run is over but there is then a final smaller wave before the price turns. (This is the 5 bars to the right of the yellow vertical lines in the charts below). We can look to trade this event or, if we are looking to trade the turn in the market, then we just need to be aware of it for our stop placement. To highlight this pattern, I have used the Euro charts from the London Open from March 9th, 2017. As we are trading the 3min charts, we would have looked to exit our EUR trades as the EUR turns down on the 3 min Fatman, as this is telling us that the EUR is overbought and will then weaken in the 3min charts. It should also be noted that the 15min and 8min Fatman are very overbought but not yet turned down. We can then trade this wave but we know it will only be a short run as there is weakness coming in the 15 and 8min chats as they are in overbought territory and can’t stay up there for long before turning down. This final wave is highlighted in the blue box on the 3 min Fatman. Once the green line turns down (at the magenta arrow) then we have a double shoulder pattern and the EUR turns, as expected, with the 15min and 8min Fatman then turning down. Recognising patterns in the charts is very important to identify trading opportunities and this comes with time and experience. Today’s news on the GBP was all about the UK Budget that was announced in Parliament by the British Chancellor. Up until that point (12.30GMT) the GBP had been weakening but it then started to strengthen with trades setting up on all six of the GBP pairs. In today’s Q&A I take an in-depth look at the London Fix and the trading opportunities that it presents. The presentation is just under an hour long and covers the following headings, with questions afterwards. 1) What is the London Fix? 2) How is the benchmark used? 3) How can the benchmark be manipulated by the banks? 4) How often does the price rally into the fix? 5) What are the typical types of trades into the London fix? In tomorrow’s live Tomahawke Q&A session I will be discussing the London fix: How we identify trades, what we can expect, and how we can trade this event. In preparation for the Q&A session I wanted to find out, for the last year, how many times the GBP rallied into the 4pm GMT fix. To do that I looked at the GBP pairs for each day’s trades (255 days) between 3pm and 4pm GMT and I have recorded my findings in today’s video in the Daily Archive. For those that are interested in trading the London fix this video gives a great overview and shows how I have compiled my statistics. On Monday I traded the GBP pairs for a net gain of 3.2% and you can find the video in the Daily Archive. I started my trading day looking at the London Open at 8am GMT but had to be very patient to wait for the trade setups that came in around 9.15 GMT. My trades were done about 20 mins later on the 3min charts for a gain of 1.5%, but I elected to stay in the trades as an example of trading in hope for further profits, as discussed in the Q&A this week. One of the trades got stopped out and 3 others went into drawdown as the trades went into congestion … for about 5 hours! The GBP rallied into the London Fix at 4pm GMT and the video shows a good example of this tradeable event and how to time the exit. The 8 hour video is condensed into 30 minutes, which was a little tricky, but I hope you find it useful and informative. I am pleased to be able to let you know that the new MT4 Tomahawke Fib Trader is now available for download from the My Account area. It is now included as a standard part of the Tomahawke Trader download. You will need to download this latest version of Trader and reinstall. In conjunction with the release of this new trading tool I have produced a Tomahawke Fib Trader setup and explanation video that can be accessed from the Training Videos>Tomahawke for MT4. I love this tool and hope you will too! P.S. The standard Tomahawke indicators for MT4 have been updated today too. This latest release fixes issues with using Tomahawke on daily/weekly/monthly charts. Please download and reinstall. We can trade in confidence if we know our trade parameters and this was the discussion in the Q&A session yesterday. During the Q&A session I showed a video of my London open trades from that morning, where I had a defined entrance and exit criteria. I have now posted that video to the website in its own right and added a trade summary at the end. This was a +1% trade and is a good video to watch the Tomahawke strategy in action. The live recording from today’s Tomahawke Q&A session has now been posted. In today’s session I focus the first part of the session by showing a video of my London Open trade this morning and also a trade from yesterday. From these trades I discuss the difference between trading in confidence and trading in hope! In part 2 of the longer term trades, from the 23rd Feb 2017, I take a look at how the trades panned out – having left them over night with my stops at breakeven. This video is a good demonstration on how we must define the parameters to each of our trades and not just trade with hope. In the next video, of trades recorded on Monday 27th Feb, and in the Q&A session this week I want to look more closely at trading with confidence compared with trading with hope. From some of the feedback on the Tomahawke indicators and strategy that we have received to date it is not everybody that wants to scalp the Forex market, and many people are looking for longer term trades with no requirement to sit by their screens all day. I am therefore now looking to develop a format to show my trades on the longer time frames using the Tomahawke system and this will be coming soon. In the mean while, a trade setup Wednesday February 23rd on the GBP pairs (15min charts) which I took and have started to document by way of a video trade example. Today’s video is part 1 of this series and shows how I identified the trade setup and took the trades. 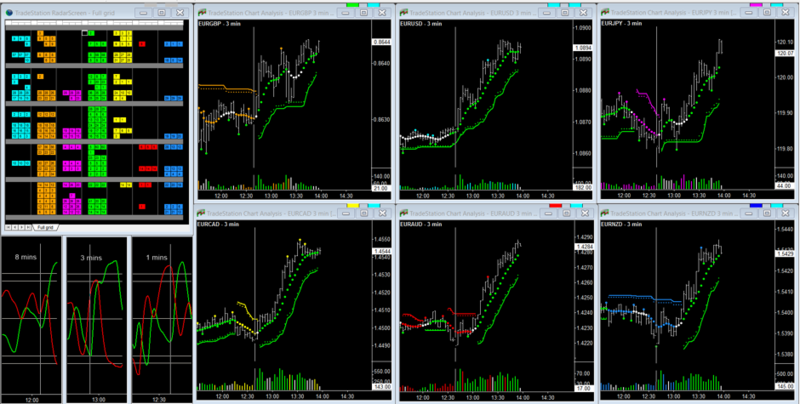 At the close of the US session (5pm ET) my six trades had been running for over 10 hours and in total were up 3.8%. This week I have been looking at how we can use the Fatman to identify turns in the market and the parameters for our trades. In today’s video I look at a couple of further examples from the trend runs on the EUR and JPY on February 22nd 2017 to help build our understanding and apply it ina a practicable way. We look at how the Fatman is used to identify turns in the market by using a step by step analysis of my EUR trades from the 17th Feb 2017. We then go on to look at the live market where we identify a turn in the 6 GBP currency pairs, determine the trade parameters on the 3 min charts and then take the trades. At the end of the video (after the room has shut) I take a look at how those trades panned out – and they all turned out to be real gems! During the session I also debuted our new MT4 Tomahawk fib Trader that will be available to all Tomahawke members to download. (I will produce a separate video on this new tool for the MT4 setup section of the website). I hope you find the education enjoyable and informative and I welcome any feedback or requests for next week’s session. Can we identify when the market turns? With the Hawkeye Fatman and the Tomahawke indicators the answer is yes. In this latest training video of the EUR from the 17th Feb 2017 I identify when the EUR bottoms out against all its six pairs. I identify the parameters for a trade on the 3 min charts (having watched the trade develop through the 1min charts), and then trade those pairs. Unfortunately I didn’t trade the London Open on Friday 17th Feb (as I was recording a video series on the Fatman that I hope to release next week) but I see there was a humdinger of a trade on the JPY, which could have yielded +20% in just 2 hours 20 mins. Wow. In the video I take a hypothetical look at the Yen trades at the London open using the Hawkeye Tomahawke strategy and indicators. It is well worth a look just to see the potential returns of the system. The Hawkeye Tomahawke Fatman identifies turns in the market beautifully. With this knowledge I am then able to trade each wave as a currency strengthens and weakens. Today I traded 3 waves in the GBP pairs between 8am and 12noon GMT for a +3.8% gain on my account. You can see how I did it in this video. Not every day is a winning day and losses are part and parcel of trading, especially on short timeframes. I believe that we learn more from studying our losses, which focus our attention on what we can learn and improve. Today’s video is from my trades on the London open which resulted in a 1.2% drawdown on my account. I analyse the trades and then play the recording in full. The recording of trading the London open on February 14th 2017 is available in the Daily Archive. I was looking for Pound strength going into the open but the Pound weakened and I was able to identify that using the Tomahawke indicators and made 1.2% gain in 25 minutes. This recording was used in the Q&A session on February 14th 2017 as a trading example. Intra day trades are subject to volatility caused by news occurrences. Take a look at this latest training video where I share the news services that I use to identify news items that may impact on my trades, how I check the news in real time, and on understanding how news events create different market conditions. If you were unable to make the Tomahawke Q&A session held on Tuesday February 14th, then I have posted the live recording in the Training Videos section. In today’s session we used my trades from this morning’s London open to look at and discuss the Tomahawke strategy for trading the London open. In the latter part of the video we tracked the GBP strength that came into the market and followed a number of trades to their profit targets. The session lasted nearly 3 hours but the video can be forwarded and rewound to points of interest. There were some very good questions asked and I hope you will find it informative. Trading the London open on a Monday morning can be a bull ride if there has been news over the weekend or dull as a dripping tap if the market is waiting for direction. Watch how I made 1.6% in 10 mins with a commentary of my thoughts during the trade in the latest video. I have just posted a recording of my trading of the London open on the 9th Feb 2017. The market really took off bang on 8am GMT and my trades were all done by 8.08am GMT. The net gain was 2.3% on my account. This is a very nice example of the Tomahawke system working on the 1 min time charts. A a new set of videos to detail the set up and installation of the Tomahawke MT4 suite of indicators is now available. A very warm welcome to all new members. Thank you for being part of the Hawkeye Family! Please use the log in box below to sign into the Tomahawke Trading System Members Area.